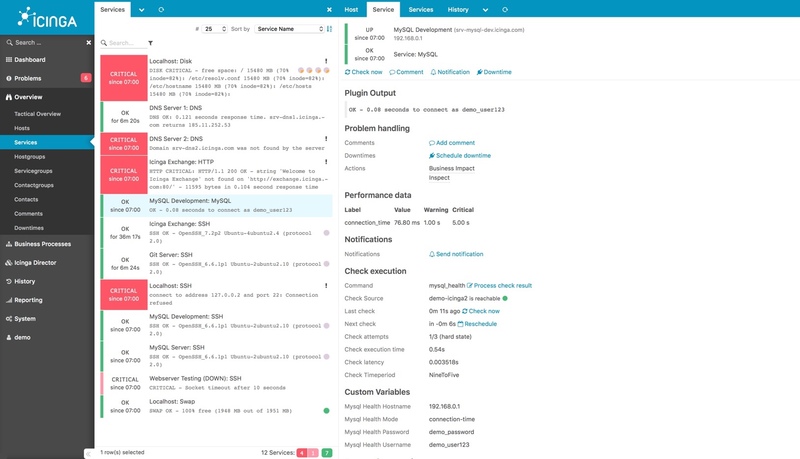 Icinga is a professional monitoring solution that continuously monitors all systems in your network, collecting data on availability and performance, and generating alerts in the event of unplanned downtime or problems. The environments of complex network environments have never been simpler: after enabling Icinga’s built-in cluster feature, you can start configuring the highly available and distributed monitoring setup. Icinga is consistently optimized for speed and can execute several thousand checks every second. Outdated results are a thing of the past. Combine a highly available application cluster with a distributed setup. The best results are achieved in large and complex environments. Monitoring as code with dynamic configuration. Create individual rules which are assigned to any host and service objects. This is how continuous monitoring succeeds. 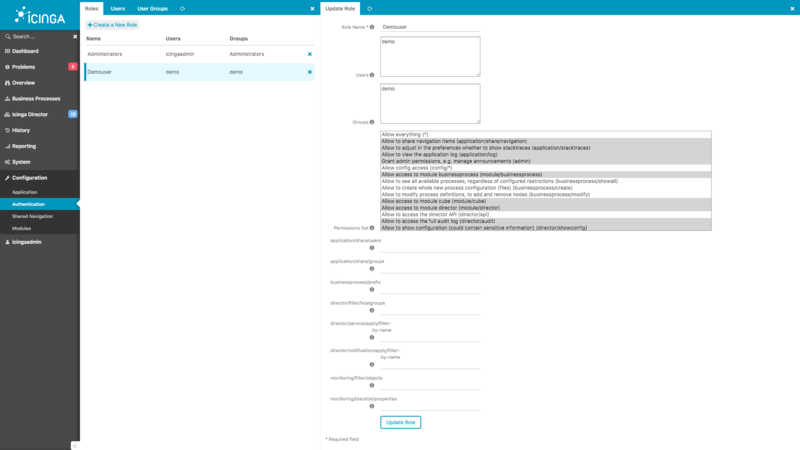 The web interface of the latest Icinga generation offers significantly higher performance than all previous solutions, supports various backends and shines with an intuitive and dynamic layout. Icinga Web has a module interface that makes it easy to integrate extensions into the web interface. A large number of already existing modules can be used for Icinga Web or individually adapted to existing needs. 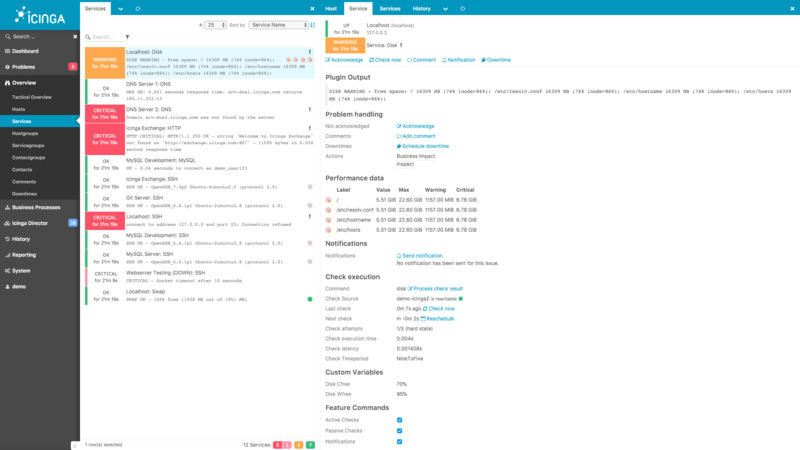 The Icinga Director is the native configuration frontend for Icinga, providing a flexible and easy-to-use interface for managing your monitoring environment. The Business Process AddOn allows you to model a complete business process from the individual monitoring systems. Of course, these processes then serve the professional alerting. 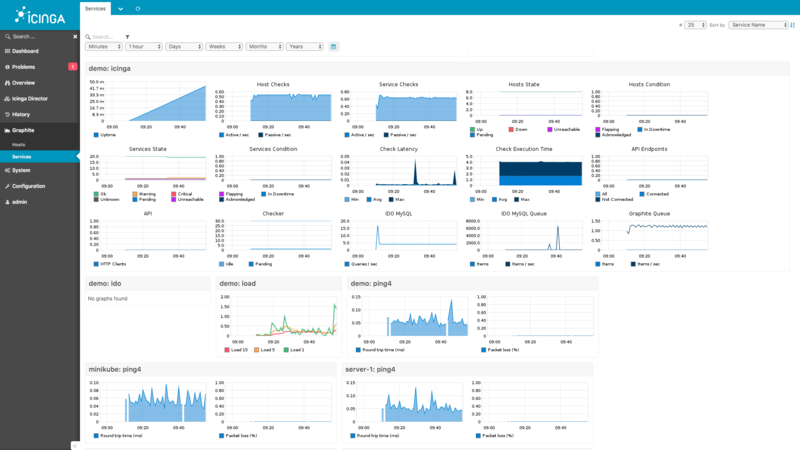 The Icinga Web Integration for displaying performance metrics directly from Graphite. So you keep the overview even without manual creation of dashboards. 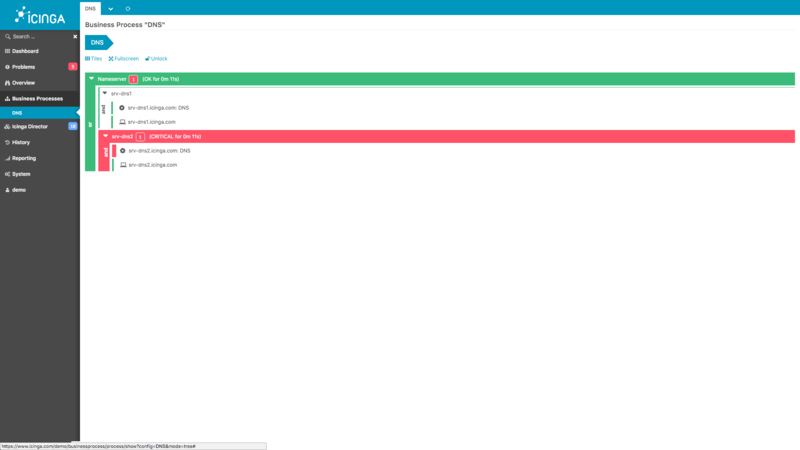 And that without further backend components. Icinga is characterized by a broad support of modern log, configuration and metrics solutions. So you decide for yourself which solution suits your environment best. Monitoring as Code has never been easier. Use the potential of the Icinga configuration or use an existing solution. Be it Puppet, Chef, Ansible or SaltStack, no problem for Icinga. For medium- and long-term storage and subsequent analysis of log files, many solutions have become established on the market. Be it the Elastic Stack, Graylog or even commercial variants like Splunk. Icinga offers a variety of interfaces for connecting your environment. Icinga delivers all performance data for downstream analysis to connected products. Icinga immediately provides interfaces for Graphite, InfluxDB and OpenTSDB as a core feature. Just activate the feature and off you go. Start Icinga as a preconfigured stack with everything needed for professional open source monitoring. Metric storage with Graphite, visualization with Grafana and of course a web based configuration with Icinga Director. Why wait, just try it for free. All NWS apps are free for 30 days. 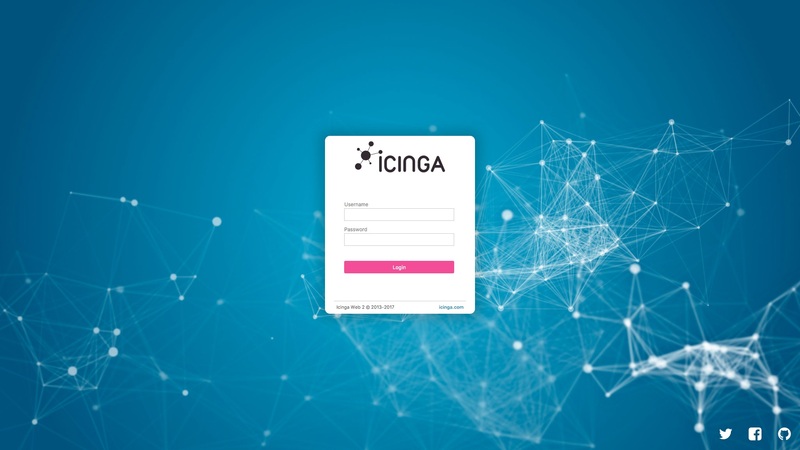 We continue to develop Icinga for you – from simple customization to custom modules to complete integration solutions. 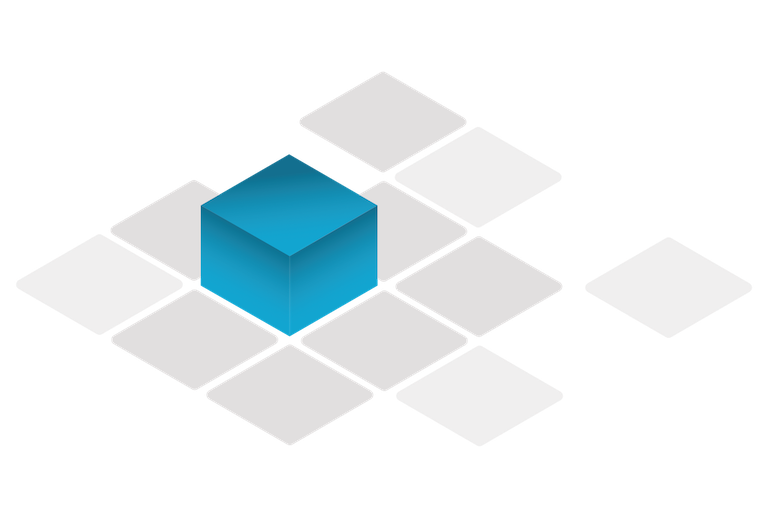 Icinga Web 2 is modular and freely customizable. 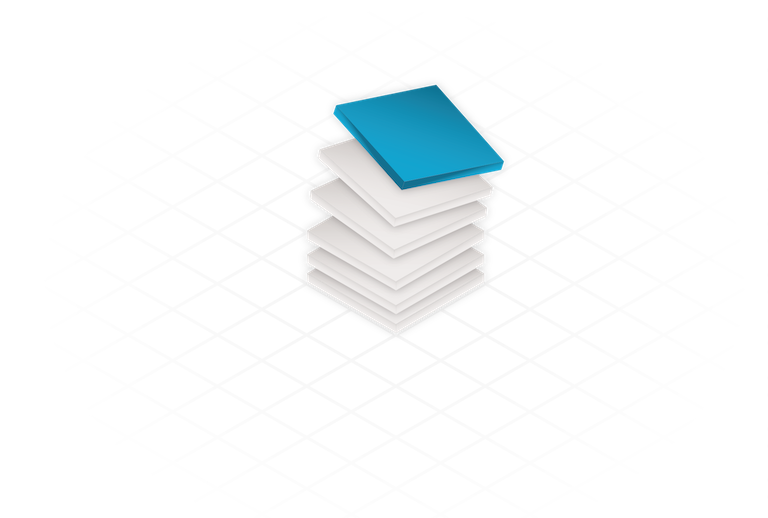 We create Icinga Web 2 modules for every application. Icinga provides open interfaces that we can adapt to your project and environment at any time. Icinga is open source and lives on the community. Become part of this community and support Icinga. With our starter packages, we want to simplify the entry into the monitoring with icinga and offer a cost-effective way to get to know the open source system. Without first having to go into large financial advance, as is often the case with commercial products. One of our experienced consultants comes on site for 4 or 8 days, sets up the system directly on site and provides the basics for further operation. The package is settled at a fixed price and there are no additional costs, as we rely on Puppet Open Source for implementation. We recommend that you visit our Icinga 2 training before booking the Icinga Starter Pack Standard. You can add this training as a module to this starter package. We are happy to bring you our experience from more than 500 projects. Whether professional services, training or support your environment. We gladly support your Icinga environment through our support team. From assistance in the event of a fault to complete takeover of the business.